I am a total blogger slacker! I've been sent a couple of cookbooks to review over the past few months that I just haven't gotten to because life has been extra crazy. But, these pickled onions are way too good not to share! The recipe comes from an excellent cookbook on preserving, Preservation Society Home Preserves. I'm tempted by pretty much every recipe in here, although I'll admit that our summer of 90 degree days and 90 percent humidity put a damper on my desire to can this summer. So, I adapted one of the recipes to make a smaller amount of quick pickles. These onion pickles are sweetened with maple syrup and then spiced up with Aleppo chile flakes, smoked paprika, and mustard seeds. They are pretty much the perfect sandwich pickle, in my opinion -- a little tart, a little sweet, and crunchy. By pickling the onions, they lose the harshness of raw onion and end up being the perfect complement to richer meat or cheese. These onions will keep in the fridge for a few weeks, but honestly they probably won't last you that long! Here the pickled onions are paired with a super simple pulled pork. The pork is rubbed with spices and salt, and then slow cooked in a low oven over several hours. The only downside of this recipe is you have to be home to babysit -- but, it will make your house smell so yummy that you probably won't mind! We piled the pulled pork high on Portuguese buns from a nearby bakery, and then added lots of BBQ sauce and pickled onions on top. Heaven! 1. Combine the salt and spices in a small bowl. Rub all over the pork. Place in a large pot with a tight-fitting lid. 2. Preheat the oven to 300 degrees. 3. Roast the pork for about 6 hours, until it is falling-apart tender, flipping the meat a few times during roasting. 4. About half an hour before the pork is done, make the maple-pickled onions. Heat the apple cider vinegar, maple syrup, and salt in a pot until simmering. Remove from the heat, and stir in the bay leaf, mustard seeds, chili flakes, paprika, and pepper. Stir in the onions. Let sit, off the heat, for about half an hour, stirring occasionally. 5. Transfer the pork to a large bowl and let rest about 10 minutes. Gently pull it apart using two forks, until the pieces are the size you like. 6. 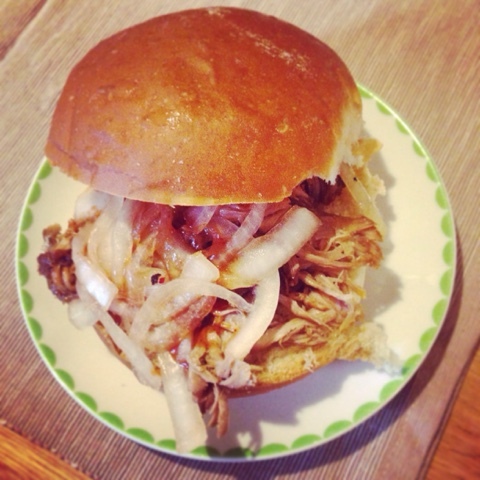 Serve the pulled pork on toasted rolls with BBQ sauce and pickled onions. The weather here in New England is finally starting to feel like fall -- cool, crisp mornings and evenings, and trees that are just starting to change color. So, I was in the mood to cook up some food that really felt like autumn. 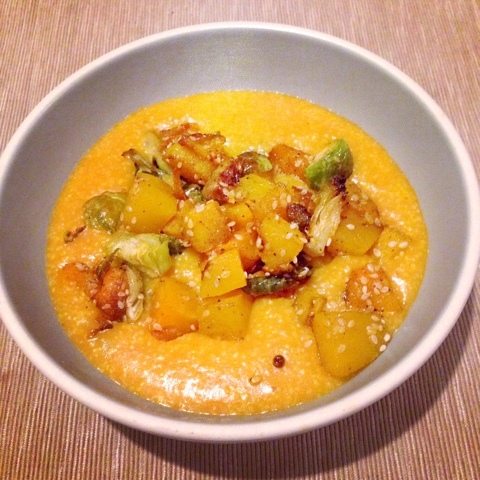 This pumpkin polenta is the perfect dish to warm you up on a chilly evening. It's got that total comfort-food feel that polenta has, with an extra dose of veggies in the form of pureed pumpkin. Be sure to purchase the type labelled "100% pure pumpkin" or you might end up with sweetened pie filling! I kept the seasoning pretty basic here with scallions and Parmesan cheese, but you could definitely add any spices or herbs you like, or switch up the cheese (I think goat cheese is amazing in polenta!). You can top the polenta with whatever you like. I went vegetarian here: butternut squash and Brussels sprouts tossed with olive oil, salt, pepper, warm spices, and sesame seeds, roasted for half an hour at 400 degrees. But, sausages would be excellent, as would a little kale salad and a fried egg. 1. Bring the chicken broth and water to a boil. Slowly stream in the polenta while constantly whisking. Return to a boil, then reduce heat to a simmer and cook, vigorously whisking every few minutes, until the polenta is thickened and cooked through. This should take about half an hour. 2. Add the scallions and pumpkin, whisk well to combine, and return to a boil. Simmer for about 5 minutes, and then remove from the heat and stir in the Parmesan cheese. Season with salt and pepper to taste.